This is an X-band image of seasonal changes at the ecological test site of Raco, Michigan, located south of Whitefish Bay on Lake Superior. The image is centered at about 46 degrees north latitude and 85 degrees west longitude. This image was acquired by the X-band Synthetic Aperture Radar onboard the space shuttle Endeavour on April 10th, 1994, and on October 1, 1994. The areas shown in red correspond to the April 10th data; the areas in blue correspond to data acquired on October 1, 1994; green indicates the ratio of data acquired on April 10 and October 1, 1994. The area shown is 22.7 kilometers by 53 kilometers (14 miles by 33 miles). Lake Superior in the upper right was frozen in April and had small waves (ripples) on its surface in October. The land area contains mostly forests and, to a lesser extent, agricultural regions. In April the area was covered in wet snow. By October, there agricultural areas were covered with grass. 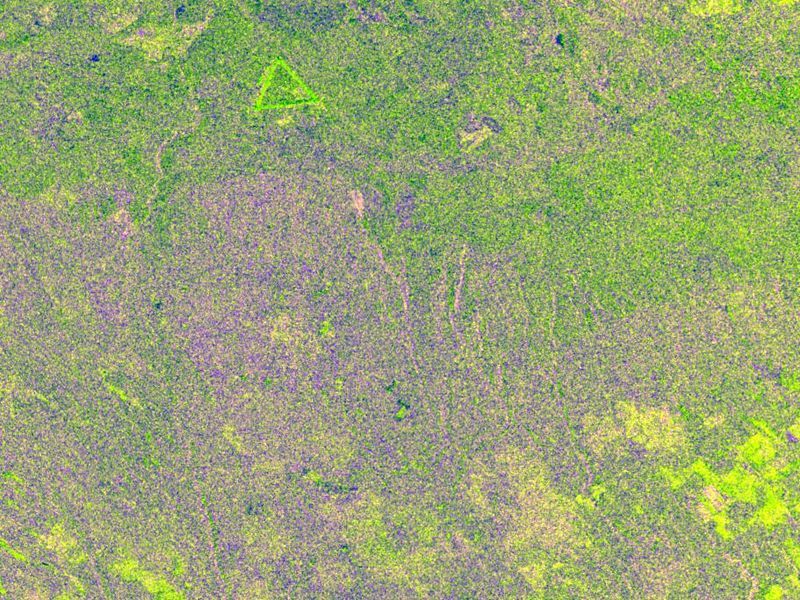 Vegetation and soils were moist due to rainfalls three days before the data was acquired on October 1, 1994. 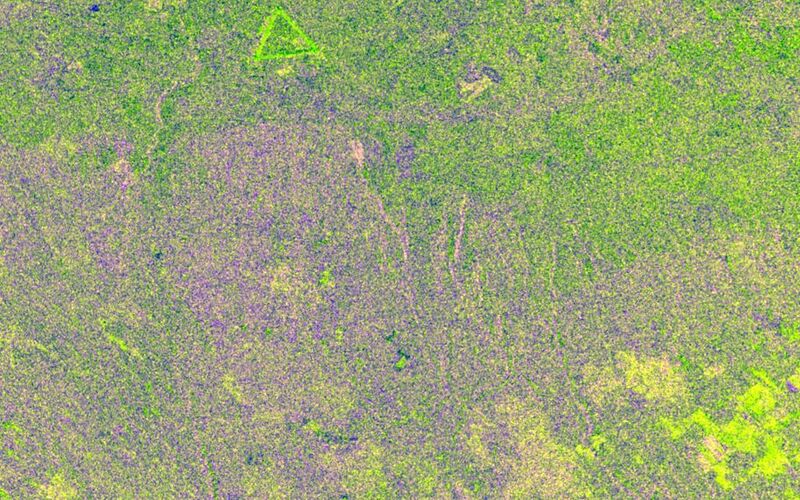 The bright light green/yellow tones in the lower half of the image show the stronger reflections of the snow-covered agricultural fields. The pinkish color corresponds to the coniferous and deciduous forests. The green area represents red pines. These trees are smaller than the surrounding forest cover and allow more radar penetration. The area is green because the radar is sensing the surface, which undergoes great change from snow to grass and fern undergrowth between April and October. 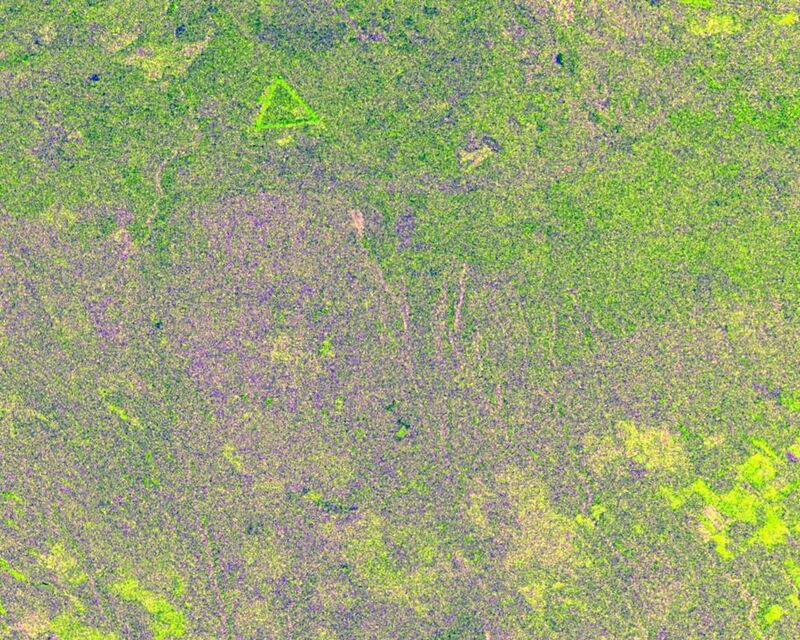 The bright green triangle in the upper half of the image is an old airstrip, while the modern airport can be seen on the bottom right side of the image. The Raco site is an important location for monitoring seasonal changes and future global change because it is situated at the ecological transition zone between the boreal forests and the northern temperate forests. This transitional zone is expected to be ecologically sensitive to anticipated global changes resulting from climatic warming. Baseline studies of vegetation are essential in monitoring these expected changes.